I couldn't resist picking this magnet up at the Charlotte airport to close out my latest Escape Home to NYC trip. 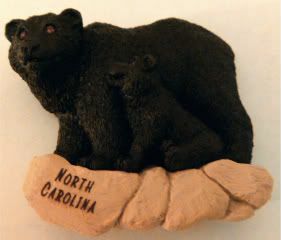 I've seen black bears in North Carolina in three places: Dan Nicholas Park down the road, the Asheboro zoo, and Grandfather Mountain - all of them were captive, though, so I totes don't count 'em. But people are sighting random bears all across North Carolina, so one day, I want to find one in my back yard. I'll be waiting. Huh. So here's something that could potentially be scary for me - as a magnet collector. I've found the wholesaler for these magnets I keep seeing. It's called Clay Critters, an 18-person company out in Indianapolis that produces all those cool (and expensive) airport magnets. Totally afraid to look at their catalog for fear that I might find enough items in there to qualify me for wholesale buying. And then this blog would never. ever. end! Hey, my name is Matt Scherger. I made that magnet in the picture, well lasered the NC. Thanks for posting these pics. Just to let you know though, we are in Lafayette, IN. We do tours as well. Keep posting! Thanks for dropping by! Love your magnets, and maybe one day I'll be in Lafayette, IN, and will definitely take the tour!